These 1939 novels introduced the caped crime buster whose adventures paralleled Batman's, and inspired Two-Face's origin (written by Norman A. Daniels as "G. Wayman Jones" for future BATMAN and SUPERMAN editor Mort Weisinger). First, doomed to darkness by a murderous acid attack, D.A. Tony Quinn makes darkness his weapon with "The Brand of the Black Bat." 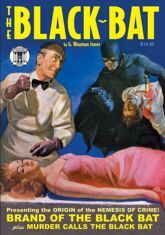 Then, "Murder Calls the Black Bat" into a deadly war against corruption as Tony Quinn battles to prevent the biggest jewel haul of the century! GOLDEN AGE OF COMICS BONUS: The debut of The Mask from Nedor's EXCITING COMICS #1. This instant collector's item showcases both classic color pulp covers and the original interior illustrations by Harry Parkhurst, with historical commentary by Will Murray and Anthony Tollin.